I got the idea for the new logo sometime around early 1996, while wandering around in the old neighborhood. In some of the older neighborhoods of the city -- Bywater, Faubourg Marigny, Uptown -- there are these very old, very distinctive ceramic letter tiles set into the cement of the street corners, spelling out the street names. I always loved these things, ever since I was a kid. They're pretty unique, as far as I've seen, and to me they are quintessentially New Orleanian. It struck me how cool it'd be if I could get duplicates of them. But no ceramicist in town that I spoke to at the time had even had the idea to reproduce them. Not only that, but I started finding that the original tiles were becoming endangered -- many street corners were being broken up and replaced, and in many instances the tiles were not being put back into the newly poured concrete. They were beginning to disappear all over the city. Then a year or so ago, it struck me that it'd be even cooler if I could turn these into some kind of digital font. 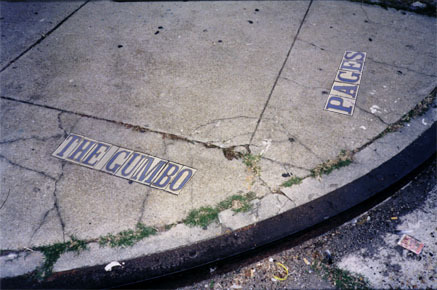 So during my trip home for Christmas of 1997, I went around Bywater, Faubourg Marigny and Uptown, with the goal to photograph enough street tiles to get the entire alphabet, with extras of the more common letters. The streets that provided the letters were Mazant, Royal, Dauphine, France, Lesseps, Burgundy, St. Roch, Elysian Fields, Urquhart, Kerlerec, Bordeaux, Jena and St. Charles. It was interesting, and a lot of fun. Lots of people wondered what I was doing. Mostly it'd be folks in the neighborhood, asking the same question: "How come you takin' pictures of the street?" I'd explain to them what I was doing, more along the lines of my interest in the aesthetic and historical significance of the tiles, and how badly I felt about how endangered they're becoming. Everybody was incredibly encouraging and supportive. One trio of neighborhood gentlemen approached me to ask, "Whatchoo doin', bra? ", and were fascinated by my explanation. One of them then offered to walk six blocks back to his house so he could get his map and help me figure out what streets I needed to hit to get all the letters, and another called his wife to ask her with great enthusiasm what streets still had intact tiles I could photograph (at first she thought he was nuts). Before too long, I had the entire alphabet, with several different examples and variations of some of the more commonly-appearing letters. The current version of the logo on the landing page was rearranged from the original by Marleigh Miller. Here's the original logo for the site, from early '94 to around early '98, designed for me by Lee Williamson. It's still a really cool logo, and I still want to use the concept in some way.